Choosing not to make a choice about upgrading to the latest ERP technology can limit your business growth. Read about the effects of a non-decision in the new Aberdeen Group Whitepaper, The cost of Doing Nothing: Why You Can’t Afford to Sit on an ERP Software Decision. When your business skips or puts off a software upgrade or new implementation, the costs and effort associated with the upgrade are deferred, not eliminated. ​Aberdeen Group – a technology and services company that helps tech sales and marketing executives distill smart data science into actionable moments – concluded in their new Whitepaper, The Cost of Doing Nothing that every month you delay, could be interfering with the efficiency of your business and hurting your bottom line. Download your free copy here for more insights into why business’ who want to grow and remain competitive act to implement the latest ERP. Knowing that you want the latest cloud ERP or business management software is the easy part, but deciding on the correct system that provides the best functionality, technology and usability and allocating time and resources can be a challenge. According to Aberdeen, the thought of committing to a new ERP system can cause companies to hesitate. So a large number of small-but-growing companies do business without an ERP system in place. For these companies to develop, they’ll need to move beyond spreadsheets – but many still hesitate to pull the trigger. 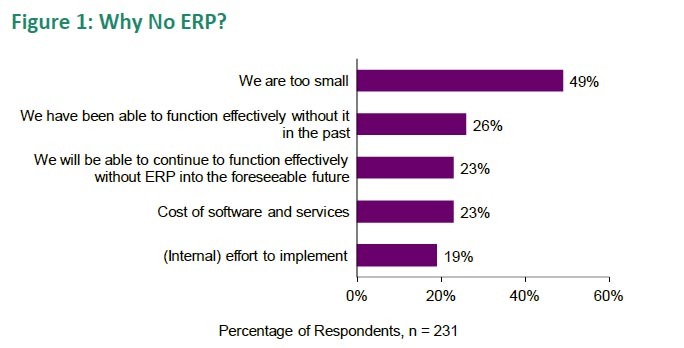 In a recent survey, Aberdeen found that 49% of companies believe they’re too small to justify an ERP system. Some 26% believe they’ve functioned well without ERP in the past, and 23% think they’ll function well without it in the foreseeable future. However, Aberdeen also found that the lack of ERP is holding these companies back in many ways. 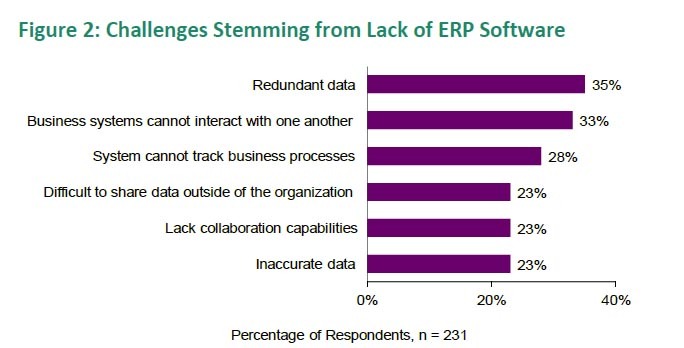 In the same survey, 35% of respondents said that having no ERP caused redundant data in their organizations. One-third also said their business systems can’t interact with one another, and 28% admitted that their system can’t track their company’s business processes. The bottom line? Once your company reaches a certain size, you need to implement an ERP system, such as Acumatica, to reach your full potential. Aberdeen notes in the whitepaper that many companies that use ERP systems aren’t achieving full value from their solutions. 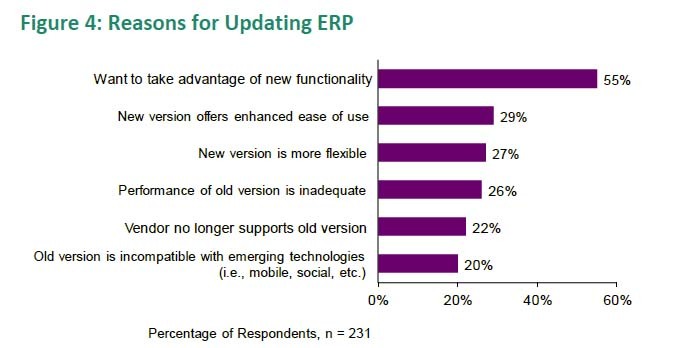 Among those that want to replace their current ERP systems, the top reasons cited are obsolete technology and a lack of features. Many companies are happy with their current ERP, but choose to update it anyway. In the Aberdeen survey, the top reason by far was a desire to take advantage of new functionality. For companies like these, the light is “on.” They know that implementing a modern ERP and staying abreast of the latest version is an important part of growing their business. According to the Aberdeen survey, companies that run their businesses on the latest version of their ERP platform perform better across key business metrics including Days Sales Outstanding (DSO), complete and on-time delivery, inventory accuracy, customer satisfaction and more. Their counterparts who use outdated ERP, or none at all tend to lag in comparison.